This was my third visit to this quaint little one of its kind property called 'The Corner Courtyard'. and I must confess I love coming here again and again for the old world charm it has to offer. With its beautifully curated 110 years old British architectural style building, It transposrts youback in time. 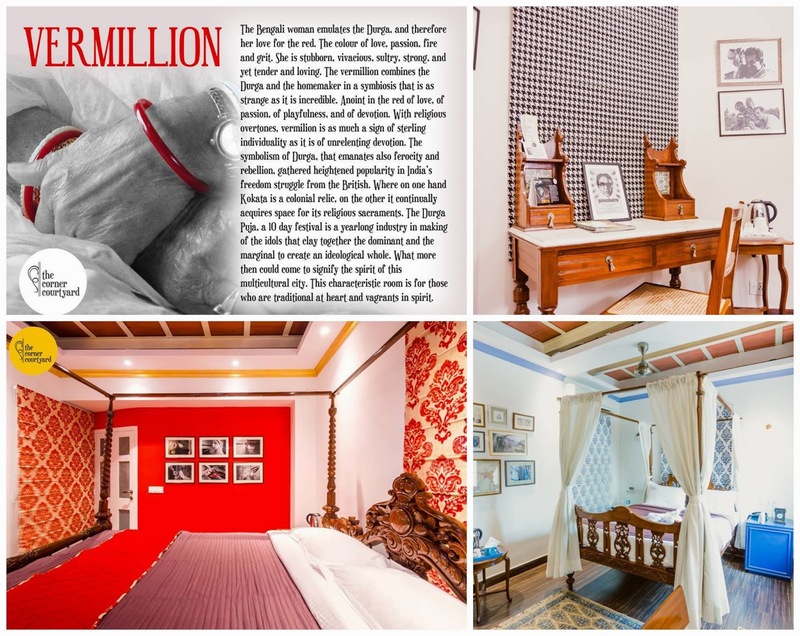 Right from the beginning the warm gracious smile of it's attendants, the luxurious colonial feel, comfy and cosy sitting, an eye for detailed decor and beautifully laid out food will make a promise of a very very good and relaxed time. This Boutique hotel with seven uniquely themed rooms, a patisserie and an impeccably designed restaurant will soon complete its first year. 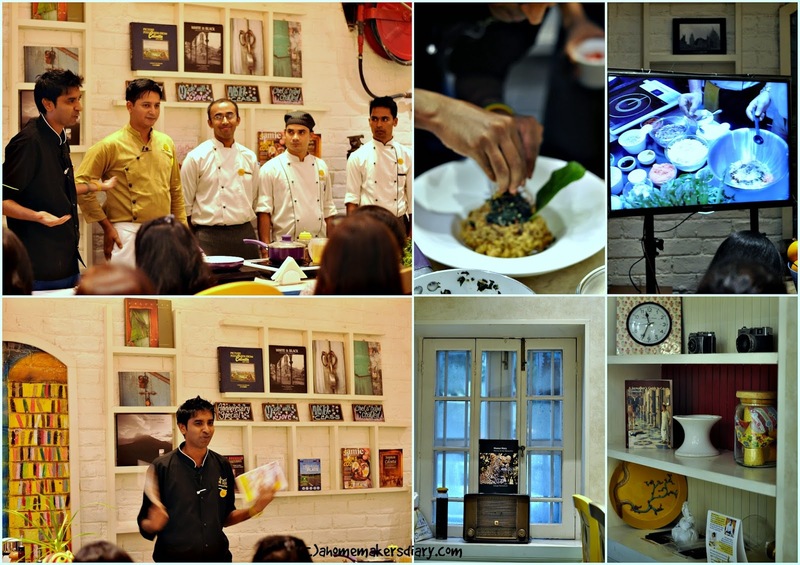 To mark that special occassion, they organised a Global Vegetarian Masterclass with its in house chef Chanchal and Chef Rohan D'souza. 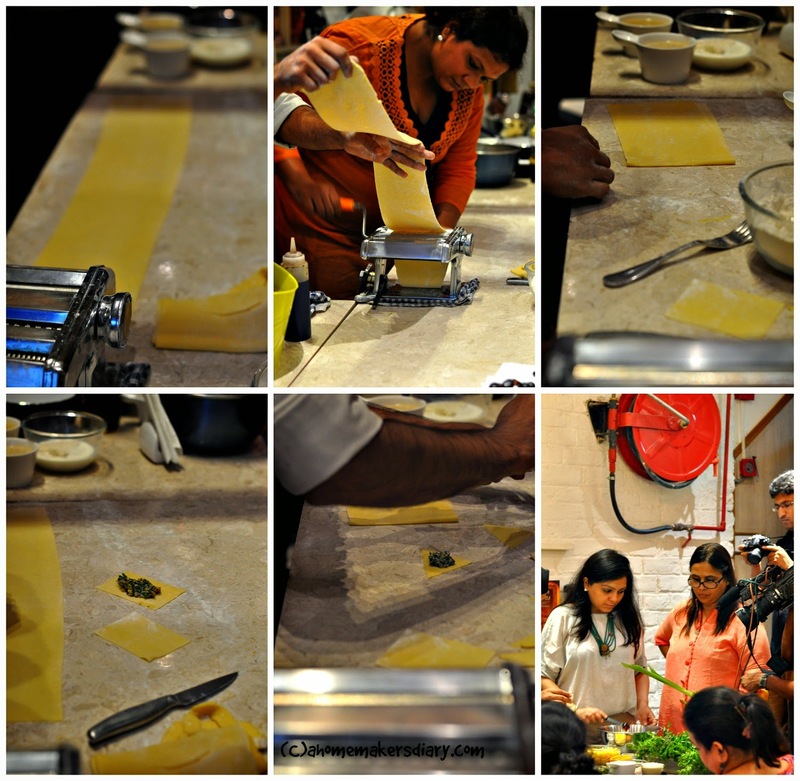 The Masterclass comprised of a five course meal recipes and a promise of hands on learning. Before I talk about the class here are some facts about the two Chef's who conducted the whole 3 hours class. Chef Rohan D'souza has a remarkable culinary history of getting trained under very respected Marco Pierre White and Chef James Martin. Often known as the 'man behind the Eaurasian Tadka' presently works with several brands under his chef consultation brand Chef Rohan Gourmet. He is the man who conceptualizes and designs the beautiful food that gets served from The corner courtyard's kitchen. Chef Chanchal Dutta is the Executive Chef of The Corner Courtyard. The person who looks after the execution, cooking and presentation of each and every plate that satiates their guests. 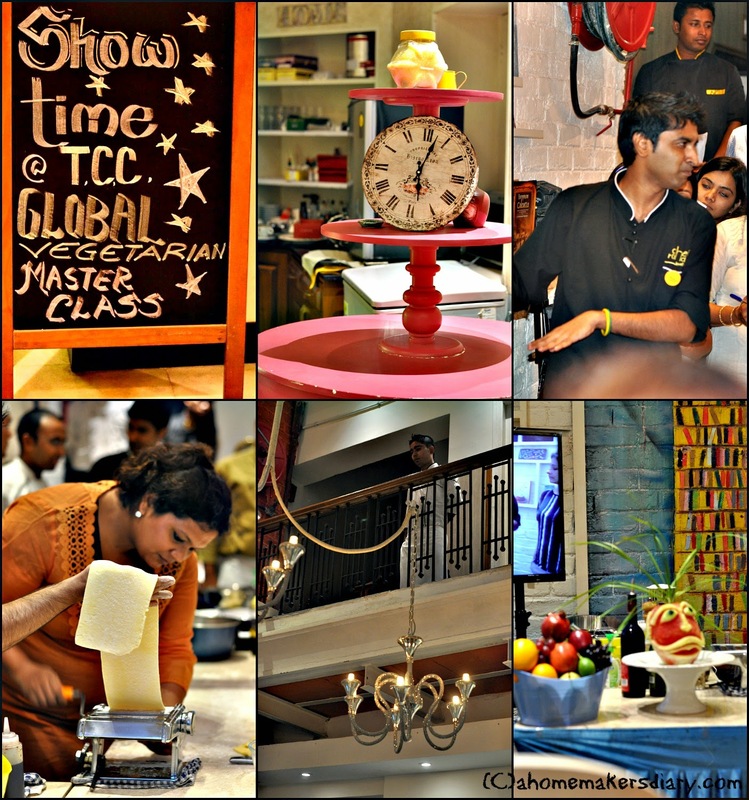 Together with the help of the entire team of TCC they put together this beautiful Masterclass celebrating local produce in a global palate. The first scoring point definitely is the wonderfully detailed recipe booklet that they gave to each of the participants. It had all the recipes in details with notes and beautiful quotations on food to inspire you and get going. To be true to the announcement Chef Rohan from the beginning inspired the participants to come and take part in the cooking process. The giant screen in the room gave others a detailed view of the step by step process. 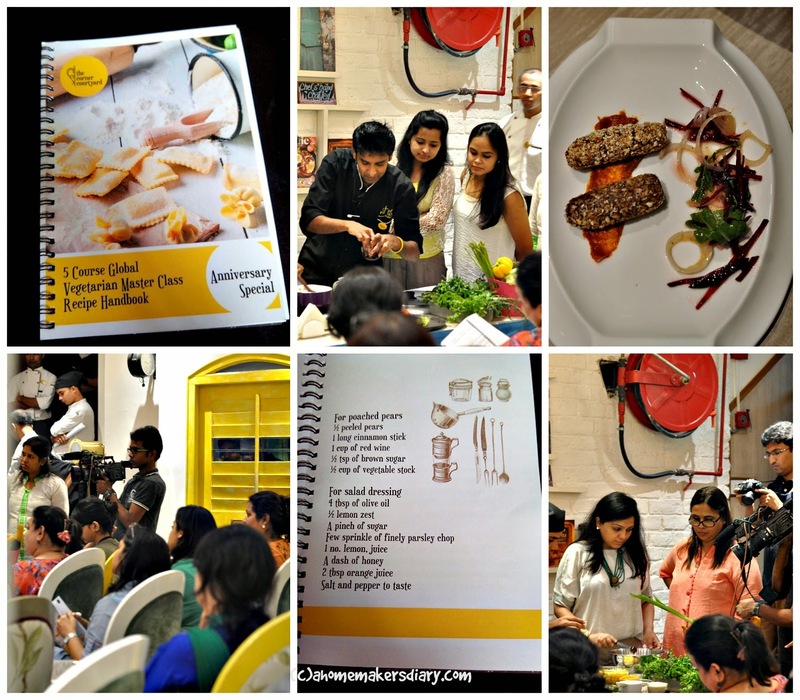 While the Chefs conducted the class the Corner courtyard kitchen kept flowing the same dish in individual plates for the participants to taste and enjoy. The first recipe of the day was an extremely Earthy soup with wild mushrooms, Asparagus and Balsamic caramelised tomatoes. I was little skeptical about the use of dry Shitake mushroom in the soup and its overpowering aroma. but it gave itself beautifully to blend together with other ingredients giving us a bowlful of warmth and beauty. 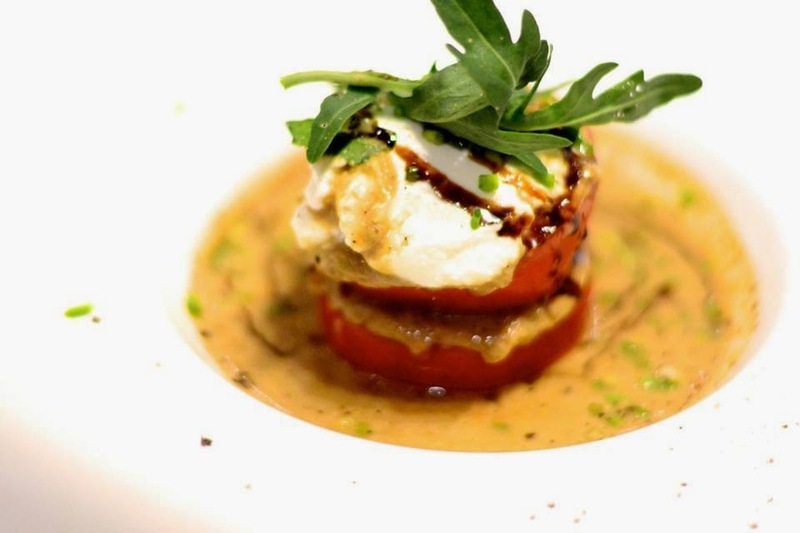 The caramelised tomato created interest to the otherwise white chunky soup. 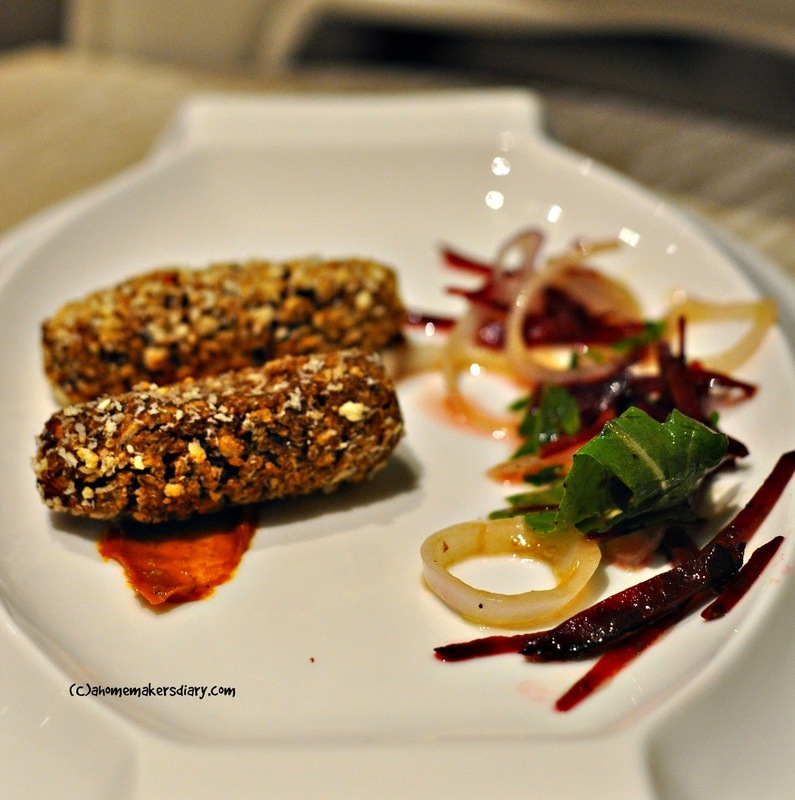 Quinoa, Veggies and Kidney beans croquet with sun-dried tomato pesto came next. To keep things healthy this appetiser was baked which made it little dry but very tasty nevertheless. The accompanied salad was a thing of beauty with julienned beets, onions and rocket leaves. A Summer Salad of wine poached Pear, mixed greens, feta and roasted almond followed suit. I have seen many poached pear dish and it never lured me to try in my kitchen but a bite into this salad and I was a convert for life. The wine poached pear tasted 100 times better than it looked. 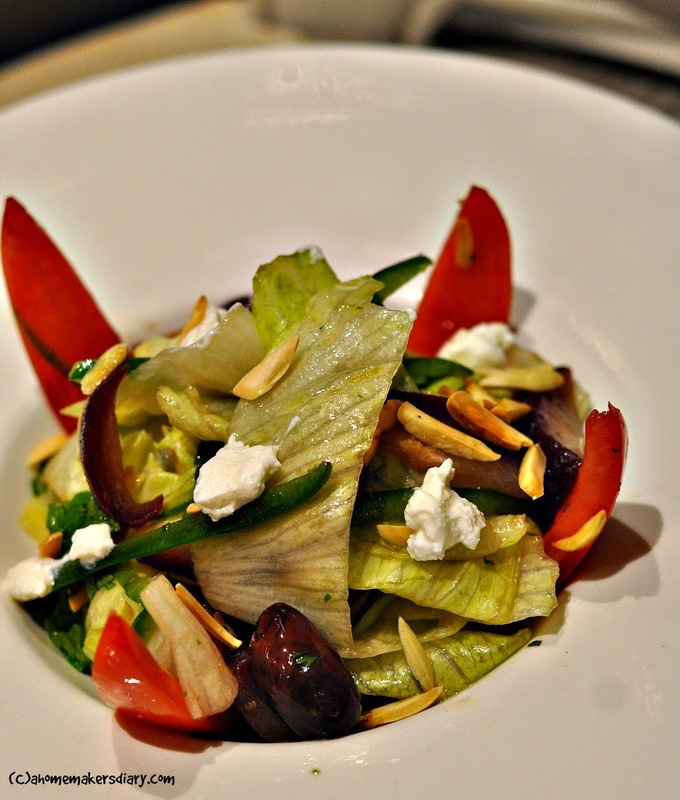 The salad offered everything from crunch of lettuce, pepperiness of Arugula, sweetness from the poached pears, zing from the bell pepper, freshness from the mint leaves, crunch from the roasted almonds and saltiness of the Feta. All together it provided happiness in a bowl. and the best part is its easy to put together and makes for a perfect lazy healthy meal in itself. The next recipe was the dish of the day for me. 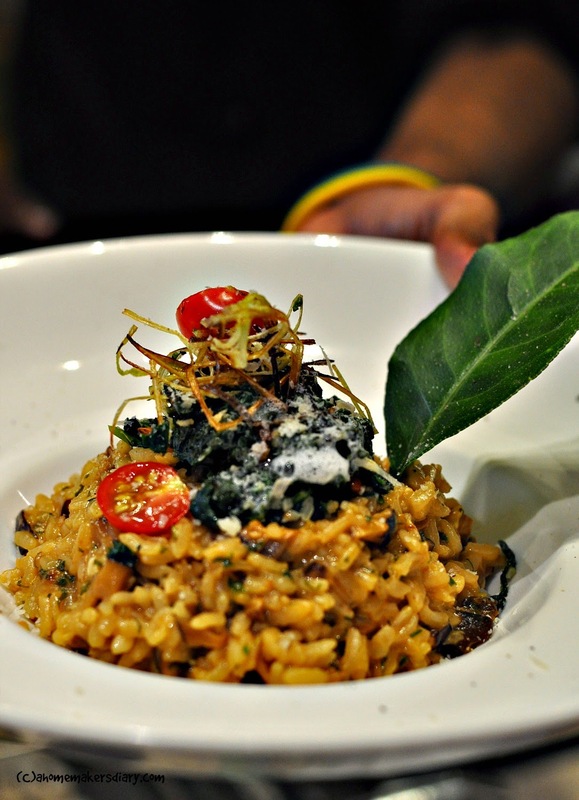 Teriyaki, Mascarpone and Mushroom risotto with grilled spinach, pine nuts and lime leaf foam. I love a good rosotto and this was too die for. The Mascarpone made it rich and smooth whilst the texture from the spinach created interest. The lime foam is what dreams are made of, pronounced lemon flavour and cloudy foam...what else do you need in a dish. If you have ever seen Masterchef Australia am sure you might have wanted to roll pasta dough in a machine...and we just did that whilst making the Roast Pumpkin, spinach and goat cheese Ravioli with a walnut mustard sauce. Loved the combination of roasted pumpkin in the ravioli but the walnut sauce could have been smoother and thinner. Also it was little bitter which took away from the beautiful raviolis. I am shamelessly late in posting this review and I apologise to the TCC team for that. The nasty throat infection with viral fever drained out all my energy and could not post it earlier than this. Seems to be a very hands on class. Must have been a great experience.